Summer sweet watermelon and mint are blended with rum in these scrumptious pop-tails! 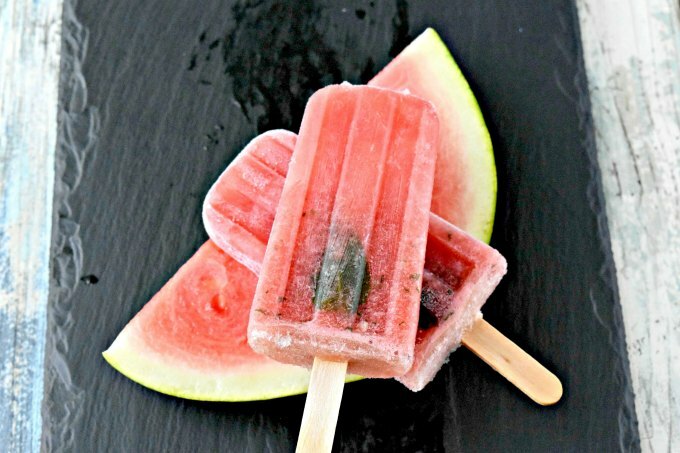 Watermelon Mojito Popsicles are just the thing to cool you off this summer! Replace the rum with simple syrup for a virgin version. Oh my goodness y’all. I cannot wait to share this recipe with you. It almost didn’t make it into popsicles. It’s THAT GOOD! Well, I think it is. The hubs, on the other, wasn’t a huge fan. But then again, he doesn’t like mint. So, he’s not a good judge of the deliciousness of this recipe. I don’t know about you, but watermelon = summer in my book. That scrumptiously sweet red flesh is too cooling and refreshing to ignore. One bite into a slice and the sweet, cool juices flood your mouth. Your mouth could feel like the Sahara and one slice will turn it into an oasis. Now, combine that refreshing flavor with cooling mint and you’ve an explosion of quenching flavor in your mouth. Mint seems to cool EVERYTHING off, don’t you think? It’s flavor is always associated with cooling sensations. I mean, just look at all those gum ads! They can’t be wrong can they? Okay. I know y’all are salivating by now. How? Because I am! And I’ve actually had several of these popsicles already. Yes, this recipe is about popsicles and not juices. Remember? As it all this wasn’t enough, I’ve added rum. Just because I can. And because I wanted to turn these into mojito popsicles for the grown ups! Of course, you could omit the rum and add just a little more honey to make sure they’re don’t freeze completely solid. That’s my biggest beef with homemade ice creams and popsicles. They freeze TOO HARD! I don’t want to take my ice cream out 30 minutes before I want to eat it. I want to take it out of the freezer right before I serve it but don’t want to sprain my wrist trying to scoop it out. The same with popsicles! I don’t want to chip a tooth trying to eat them. They’re not that way in stores so why do they have to be at home? They don’t! You can add things like honey, simple syrup, molasses, and alcohol to make them softer. This is easier to do with popsicles than ice cream. I haven’t quite mastered the soft ice cream yet, but I have gotten the popsicles to a good consistency that I don’t have to run to the dentist after eating them. And for me, the best way to do that is add alcohol and honey. Yes, these are adult popsicles. Omitting the rum means you need to up your honey to keep them from freezing solid. Or you could replace the rum with simple syrup of equal amounts. It will make the popsicles sweeter, but save the kiddos from a hangover. Both of these ingredients have a super low freezing point. Actually, I think we’re talking liquid nitrogen levels of freezing in some cases. It’s -175.3F to be exact. That’s pretty damned cold. I can’t imagine anyone’s freezer getting to that level of cold. So, yeah. How is it that I’ve only made one watermelon recipe for my blog? No, really! There’s just one. Watermelon strawberry martini. That’s it. I need to remedy that. And I need to make more watermelon popsicles. Or maybe one of those watermelon feta salads. The other day we served up some watermelon with breakfast. I lightly salted it with maldon salt. The hubs thought I was off my rocker, but that little but of salt really did kick up the sweetness. I made sense and made me want to try watermelon in a savory recipe. So, look for a watermelon feta salad. I think one will show up on the blog soon. So, you’re probably wondering what that big blob is in the popsicles. It’s a piece of mint. I thought they would look all cool in the front of the popsicle. But, it doesn’t. Sadly, they all have one. Not that it makes them taste bad. It’s a little extra mint flavor towards the end. It just didn’t turn out the way I thought they would look. My freezer is so cold. Heh. I can hear some you thinking, “How cold is it?” thinking this is a joke. It’s not. It’s just super cold! When I took the popsicles out to photograph them, they formed this frost coating that I tried to wipe off. Didn’t quite work and left these streaks on my popsicles. I wasn’t having the best photography day, was I? Even though they don’t look picture perfect they taste amazing. Like I said in the beginning these almost didn’t make it into popsicles. I still have some leftover mix in a jar in the freezer. I may have to drink that when I get home from work today. You could easily skip the freezing part and just drink this mix as a cocktail. Just be sure to add that piece of sugar cane they usually serve mojitos with. I’m also thinking a cairpirinha would be good, too! Just switch it up and have some sugar cane liquor and some lime to the watermelon. Oh my. I may have to share that on the blog, too!! So many watermelon ideas to make up for my shortage of watermelon ideas! Make sure to see what the rest of the bloggers are serving up today for #FarmersMarketWeek! I have a feeling we have quite a few hot summer days left this year, so these need to be in my freezer. Loving them! I hope you enjoy them! I have been all week long. So so delicious. I know I like both watermelon mojitos and watermelon sorbet, so love the idea of combining both in these popsicles. Perfect for this heat! Mmmmm watermelon sorbet. I’ll have to try that next time. These look FABULOUS! I love the sound of them. And I honestly have zero watermelon recipes on my blog so I understand 😉 But it’s so good to eat all by itself!!! It definitely is. I had to fight the hubs off the half I was saving. Of course, I did snag a few chunks to nibble on while I was making these. I’m totally going to make these before summer is out. One batch for Mom and Dad and one batch for the kids! I knew it was mint and I don’t think it looks bad. You have to have mint in a mojito , after all. That’s for sure! It’s not a mojito without mint. Who knew adulting could be so delicious? Those things we learn as we get older…. These look so refreshing! I wish I had one right now. They’re so simple to make. You could whip up a batch and have several! These DO look picture perfect! And they sound delicious! I just discovered that using alcohol in sorbets keeps it from getting rock hard. Thanks for the reminder that I can use this trick with popsicles! I love watermelon and feta! These pops look soooo refreshing. Wish I had them on this hot day. I haven’t tried watermelon and feta yet. I can’t wait to try them together. This makes me feel guilty for not using my popsicle molds this summer…and last summer…I really need to dust those little suckers off!!! For sure! I hadn’t used mine in a while, too. And we BUY popsicles! Why? What a fun flavor for popsicles and I love that i won’t chip a tooth. Biting through a hard popsicle always gives me the shivers! For sure! I always hated having to gnaw on my popsicles.